Town boss Jamie Fullarton praised the two halves of his side’s performance after they beat League Two Morecambe 1-0 at The Shay in their FA Cup first round replay. Cameron King’s goal helped set-up a second round tie at home to League One side AFC Wimbledon live on BT Sport on Saturday, December 1. 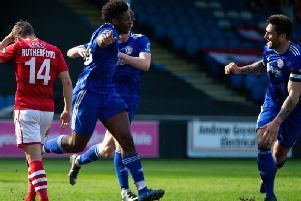 The Shaymen outplayed their higher-division opponents in a terrific first-half display, before digging deep to stave off the visitors as the game wore on with a disciplined defensive effort. “It was almost a complete performance, but in two halves,” said Fullarton. “In possession in the first-half, I thought we were excellent. “I thought we had real clarity in what we were trying to do, they understood the game plan, they implemented the game plan, they showed guile, intelligence, enthusiasm, and it resulted in us creating a number of chances. “At no point, out of possession, were we under pressure. “Second-half, as you expect, against a league team, who are lucky to be one-nil down, they came out with an urgency which meant the balance of the game flowed towards them. “Without the ball, in the second-half, not only were we diligent in our individual role and responsibility within the team, but collectively to a man, from the front all the way back to the goalkeeper, they contributed. When asked if he took a lot of pride in his side’s performance, Fullarton said: “I try to remain balanced, and add context to what happens in games. “What happens after a game like today, because it’s a result against a team in a higher division, and you won the game, sometimes you get swept along in the euphoria. “There’s many a time in a 0-0 draw that the performance has been very similar, but it’s been 0-0 against a team in our division, so therefore the enthusiasm of you guys in the media is a little but more apathy as opposed to ecstasy. “Whereas, what you look for as a coach or a manager, can you help the players perform to a level that reflects what you are, what you do all week with them? “And it’s those behaviours. That pride you refer to? Yeah, I’ve seen that tonight. “All the club is looking for is that I reflect what they stands for, and what is the club? It’s the fans, it’s the chairman, it’s the board. “I think tonight that is one of those cases. Again, it’s the romance of the cup because, most weeks, irrelevant of the results, the players do that. “Therefore, there’s a certain level of expectation from me. That doesn’t mean wee play well all the time, or we don’t make wrong decisions, or give the ball away, or create the chances but convert enough. Town arguably produced their best attacking performance for weeks in the game, playing some fast, incisive football. “Again, it’s the understanding of what’s expected and tonight, we had square pegs in square holes, and players really starting to work together,” Fullarton said. “It’s a new squad that was brought in in the summer, and with injuries and suspension at times, it’s meant we haven’t had players, and we’re still missing important players. Town also kept their third consecutive clean sheet, and have now only conceded once in their last five games. “What it does, it breeds confidence,” said the Town boss on their defensive record. “From a manager’s point of view, clean sheets and victories mean the players believe in what you’re asking them to do. “It’s much easier to believe what you see, than what someone tells you. “We’re working on it on a daily basis. I’m relentless in my preparation. “Even on the days when we haven’t performed or got a result, our preparation is of the same level. And it’s about making sure you do everything you can to give them the best opportunity to go and win the games. “And from a professional point of view for players and staff, it’s the challenge of pitting yourself against teams in that higher league. That’s where the romance of the cup comes in. “Wimbledon are a League One club, and they’ve shown in the previous round that they can go away to a team in a lower division, with a no-win scenario, and come out on top.